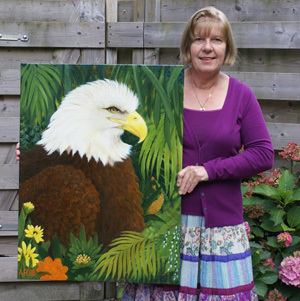 My name is Angeline Rijkeboer, I was born in 1951 and live in Blaricum in the <?XML:NAMESPACE PREFIX = ST1 />Netherlands. My favourite subjects are animals, especially wildlife, birds and pets. I also like to paint landscapes and little villages. I took watercolour lessons at an art academy for two years but most of the techniques I have learned from experience. I also consult painting technique books. All my paintings on canvas are painted around the side (see photo on the right), so they don?t need a frame but can be framed if preferred. The pastel and watercolour paintings are supplied with a passe-partout frame. If you are interested in ordering a painting please get in touch. I can supply all subjects from a photograph or from fantasy.